This Cotton Solid Color Woven Yoga Blanket is a perfect blanket to cover yourself up in Shavasana to keep your body warm as it cools down. These blankets are 85% New Recycled Cotton and will thicken and soften with washing. Blankets tassels will match the blanket color. 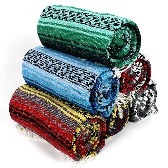 Approx Dimensions: 78" x 54"
Blanket size and weight can differ between blankets and colors options. We want you to be completely satisfied with every item you purchase from us, which is why we offer a 30-day ''No Questions Asked'' money back guarantee on this product. Please see our return policy for details about returning merchandise. Do to color variation and material content, blanket weight can and will differ from color to color.